You’ve made resolutions in the past to be healthier and more adventurous, but this year is your year to actually make it happen, and good news, we’re here to help. Who do you want to be in 2019? What do you want to accomplish? Call me an optimist, but I love New Year’s Day. For me, it’s like I get the chance to hit life’s big reset button. Midnight hits, the ball drops, and I’m all of the sudden, miraculously refocused and determined to check-off everything on my resolution bucket list. One of those things on my list this year, along with so many of our other members, is to hike the Incan Trail to Machu Picchu in Peru. To make it to this UNESCO World Heritage Site, I’m going to have to walk 8-12 miles a day. It goes without saying that I’ll be starting my training January 1st with our New Year’s Day Hike. I’ll leave you with another corny quote by C.S. Lewis to hopefully inspire you to join us on January 1st and/or any day after, “There are far better things ahead than any we leave behind.” We’ve got bigger and better adventures planned ahead for 2019, whether you want to stick around in Houston or travel the globe, visit our websites to find out more! 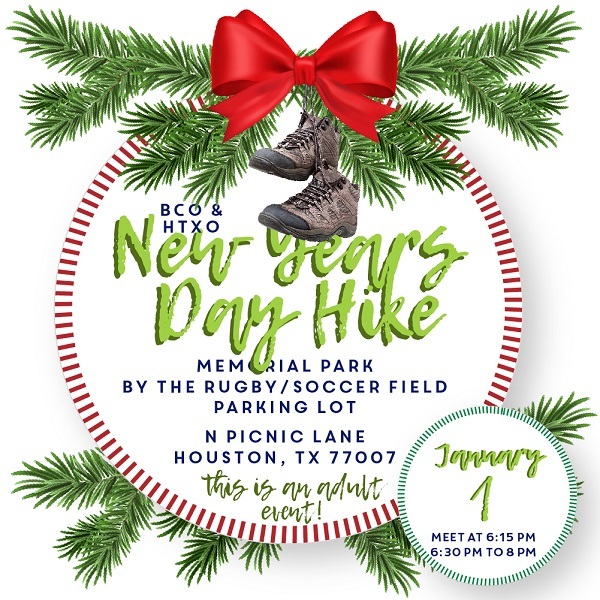 We’ll be meeting at the Rugby Field Parking Lot in Memorial Park, and heading out at 6:30 pm promptly, to hike some of Houston’s best inner city outdoor trails. The hike will most likely last until 8 pm. Please leave your human kids at home, but feel free to bring your other furry ones. We find our four-legged friends can keep up on hikes and are less impacted by our undistinguished adult behavior. RSVP at https://bit.ly/2AU6ri0 For additional info, please call 713-524-3567 or e-mail to info@bayoucityoutdoors.com .